When singer Dean Martin was paired with comic Jerry Lewis from 1946 to 1956, the duo were a smash hit across the media spectrum: in nightclubs and movies, on radio and television. In 1956, their partnership came to an end but each went on to have great success as individuals. Martin starred in movies like Howard Hawks' Rio Bravo; had hit records, like the #1 single "Everybody Loves Somebody"; and was a member of the 1960s Rat Pack, performing alongside Frank Sinatra and Sammy Davis Jr. When NBC approached him about a variety show, Martin made demands for a great deal of money and only being required to show up on the day of the taping, which would be Sunday, assuming the terms wouldn't be accepted. He was wrong, and The Dean Martin Show ended up running for nine seasons from 1965 to 1974. Out of those 264 episodes, the two-DVD set TIME LIFE is offering contains seven episodes that range throughout its run. Disc 1 presents episodes #21 (2/3/66), #2 (9/23/65), #803 (9/14/67) and #427 (4/3/69). Disc 2 features episodes #811 (11/23/72), #701 (10/13/66) and #516 (1/15/70). Each DVD also offers Bonus Features in the form of interviews. Disc 1 (47 min) presents actresses Angie Dickinson and Florence Henderson, comedian Jonathan Winters, and Dean's daughter, Gail Martin Downey. Disc 2 (56 min) has the show's music director Lee Hale, comedians Norm Crosby, Phyllis Diller, and more Jonathan Winters. Why they aren't in order is unknown, as is the reason for the episodes being edited, which goes unmentioned. The show ran an hour, but the run times are all different (Episode #21 was cut down to a mere 19 minutes) and the credits reveal unseen sketches. The episodes can be viewed collectively or individually, and there is an option to select individual sketches. What is presented is very entertaining, though some of the material is slightly dated. Martin is a very charming host and no one seems to be having more fun than he is. He had a great singing voice and was a natural, quick-witted comedian, as evidenced by his adlibs, which cracked up fellow performers and the crew. He and the writers played off his boozy persona, which is not the fodder for comedy and laughs that it used to be. The show features comic sketches, songs, and dance numbers with Martin being joined by some of the era's biggest names in show business. Appearing in this collection are Bob Hope, John Wayne, Peggy Lee, Jack Jones, Jimmy Stewart, Orson Welles, Michael Landon, Don Rickles, Don Adams, Jack Benny, George Burns, Dinah Shore, Jonathan Winters, Sammy Davis Jr., Andy Griffith, and Paul Lynde. Also appearing are series regulars Dom DeLuise, Nipsey Russell, and frequent guest Rodney Dangerfield. While there is a lot to enjoy, there are a few odd moments as sensibilities have changed over the years. Aside from the dated feeling of the alcoholic humor, some of the jokes involving race and women are awkward. A number of the dancing girls get kissed by Martin and others throughout, which comes off slightly creepy since we don't know if the women were okay or doing it in order to keep their jobs. And I can't imagine that even back then it didn't strike people as odd seeing Sammy Davis Jr. singing a lounge version of Glenn Campbell's "Wichita Lineman." 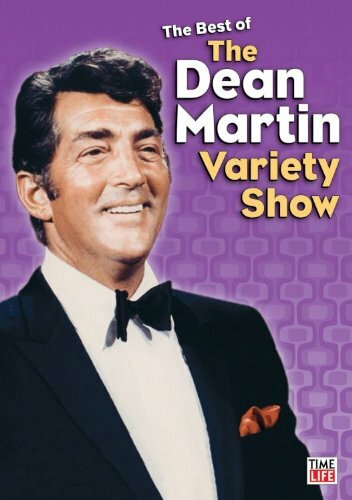 The Best of the Dean Martin Variety Show is a marvelous television time capsule, available as a single DVD, a double-DVD set, and six-DVD Collector’s Edition.